Wolfgang Herrndorf’s young-adult novel Tschick is already available as an audiobook, as an illustrated novel and in a stage version. Film director Fatih Akin is now bringing the story to the big screen – and expectations are high. Since its publication in September 2010, Wolfgang Herrndorf’s young-adult novel Tschick has enjoyed continuing success. The summer tale of adventure, told from the perspective of the outsider Maik, has been translated into more than 20 languages, won a number of prizes and sold more than two million copies worldwide. The book has long been on school reading lists as well as being adapted for radio and the stage. Now a film adaptation is on its way. Almost exactly six years to the day after the book’s publication, the launch of the film adaptation of Tschick by multiple-award-winning director Fatih Akin (Head-On, Soul Kitchen) is again drawing great attention to Herrndorf’s work. The film features Tristan Göbel as Maik and Anand Batbileg as Tschick. Just how important Tschick was for Wolfgang Herrndorf is recorded by the author in his autobiographical Work and Structure: “I’m immersed in the story as I’m writing it, as I was at the age of twelve when reading books.” The writer, who died in 2013, was unable to witness the full extent of Tschick’s success. The power of the original text has prompted numerous artists to produce their own treatment of Tschick. The stage version by Robert Koall, which received its premiere in 2011 at Dresden‘s Staatsschauspiel theatre, has in recent years played in more than 50 theatres. The Theater Hagen plans to premiere an opera version of Tschick in March 2017. 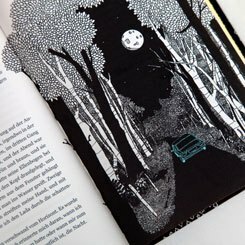 Laura Olschok won the Büchergilde’s Designer Prize for her Tschick illustrations | Photo: © Martin Mascheski/Edition Büchergilde In addition, a beautifully illustrated book edition of Tschick was published by Edition Büchergilde in June 2016. The young illustrator Laura Olschok was awarded the Büchergilde’s 2016 Designer Prize for her contribution to the book. “I didn’t know the novel beforehand – only the title seemed familiar,” she recalls. But we are immediately captivated by Olschok’s stylish, minimalistic cover. On a black background, she has drawn a map showing streets, trees and houses. At various points on the map, we see the stolen light-blue Lada in which Maik and Tschick drive around for a week exploring the German countryside. “The story of Tschick is so powerful that I immediately had a picture in my head for every scene,” says Olschok. There are also several versions of Tschick in audio form. The audiobook published by Argon-Verlag is read by the actor Hanno Koffler in a lively and unaffected manner. And to coincide with the film’s release, Rowohlt is publishing a number of books and e-books about the successful novel and its author. Wann hat es ‘Tschick’ gemacht? (When Did It Go ‘Tschick’?) brings together for the first time all the interviews with Wolfgang Herrndorf of which transcripts are available. Tschick – Das Drehbuch (Tschick – The Screenplay) by Lars Hubrich, containing the complete film script with notes by Fatih Akin, goes on sale in September 2016. Wolfgang Herrndorf believed that film adaptations of literary works should ideally shake off the shackles of the original text. Whether the film manages to do that is something the audience will be able to decide for themselves following its German release on 15 September 2016 and its subsequent screening in other countries. Antje Ehmann works as a freelance journalist and jury member for children’s and young-adult literature. Fatih Akins adaption of the cult novel "Tschick"